Customers come in several forms. While some might have a pretty good idea of what they want others might need guidance. In other cases, customers are simply angry right from the moment they picked up the phone. Hence, the job of the outsourced customer support representative becomes impossible. First, he must calm the customer’s nerves if he wants a realistic chance of discussing anything on its merits. A fair amount of customers a call center agent speaks to would be this way. Why? They probably picked up the phone because there is a problem with the product or service of the business. If that doesn’t make them angry, the circumstances of their everyday life would do the trick. So, whether you are an Outsourced Call Center Services provider or a business with an in-house call centre, the importance of dealing with this category of customers cannot be overstated. 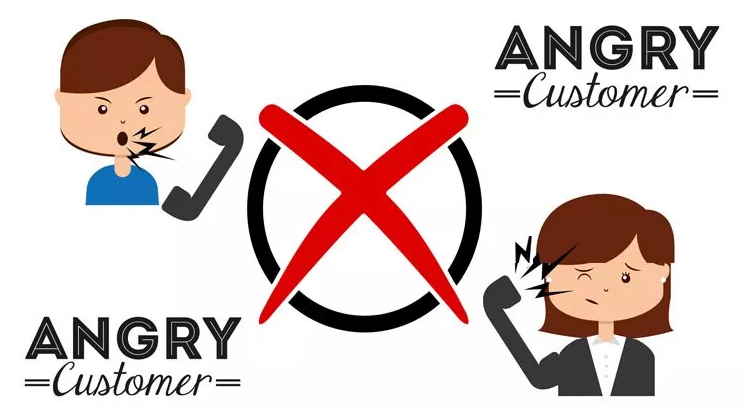 The following are some of the ways to deliver the best customer service without getting into a fight with the customer. People generally react rashly in circumstances they aren’t prepared for. If you think most of the customers you speak to would be of good conduct, then you’re in for a scary surprise. Call center outsourcing companies hold specially training and mock sessions that are intended to prepare agents to handle situations where in many customers are already irritated before picking up the phone. Hence, this reduces the tendency to react harshly to the customer. While it might seem like the customers are consciously taking shots at call center reps, this cannot be farther from the truth. As stated earlier, customers are angry because something is wrong with the product or service rendered or in their lives. Consequently, it is important to recognize that it’s not personal warfare. Understanding where the customer is coming from puts things in the right perspective. You immediately focus on identifying with the client’s needs rather than engaging in endless banter. Also, this is a precursor to solving the client’s problems. You can never go wrong with apologizing. This is largely due to its disarming effect on the customer’s ego. The customer probably picked up the phone expecting a fight. To be immediately met by an apology changes the narrative of the conversation. Good customer service agents understand that saying sorry to the customer has nothing to do with right or wrong. Running successful businesses means keeping the client happy. Hence, you must be willing to put aside your personal ego in attending to the customer’s needs, something outsourced customer care service providers understand very well. An angry customer more often than not simply wants a listening voice. Unfortunately, agents of customer service outsourcing companies are the easiest target for the customer’s venting. If you try to talk back at the customer while he is telling his story, you would only escalate the client’s temper. The better approach would be to listen to the client while he tells his story. Ignore the tone of the manner of the story but focus on solving the customer’s problems. If you take this route, you would discover two things. First, as soon as the customer gets out all his grievances he becomes easier to talk to. Second, the story would reveal the client’s biases and innermost needs. A customer service agent should be solution driven and nothing calms a customer’s nerves better than answered questions or problems solved. They take time to listen through the anger then identify the customer’s problems. Consequently, the client is provided with solutions to those problems. In providing solutions, it is important to communicate your opinion about the problems to the customer. Subsequently, the client should be provided with multiple options where possible. If you outsource customer support, make sure that you give in-depth training to your agents on your product or services in the call centre outsourcing company else they will not be able to provide satisfactory solution to your customers. As a customer service agent, you want to win every customer over with every phone call. However, the reality of life dictates that you cannot provide answers to every question. While you might be tempted to make up an answer, this might not be the best approach for an angry customer or any customer at all. If you provide false answers to an angry customer, he’ll be angrier the next time he calls. Also, whatever goodwill you have garnered with such a customer is immediately lost. The better approach would be to be straight with the customer regarding his problems. You should then inform the customers of alternative solutions to ease his pains. If you use outsourced call centre service provider, make sure that they follow the same approach with your customers. Providing world-class customer service requires going an extra mile for your customer. This including knowledge of the personal details of the customer, including the name. Calling a customer by his or her first name makes the conversation personal. It gives a subtle hint to the customer that you care about his problems. This might be a risky tactic but would work on the right customer. The trick is gauging how angry the customer is before asking clarifying questions. If the customer is receptive to the question, it’s a quick way to defuse the situation. Reps of customer service outsourcing companies get extensive training on how to execute this properly. There are instances where all the approaches mentioned above would simply not produce a positive result. Why? The customer might be simply unreasonable. In this case, the best approach is to stand your ground. This is especially so when the customer is verbally abusive. To de-escalate while being assertive, communicate your views to the customer in a soft tone. Do otherwise and he/she assumes you are ready for a fight. Listen – pay attention to the customer’s words and never interject when the client is venting his anger. Agree with the customer’s problem – this gives assurances to the customer that his problems are valid and they’ll most likely be solved. Act – take conscious steps to solve the customer’s problems. Be grateful – thank the customer for sharing the problem and give positive affirmations to what they say. Explain the solution – the customer wants to know that you would solve his problems but more importantly how you would solve it. At LiveSalesMan, we have years of experience and expertise in handling customer relations and psychology. If you are looking for Inbound call centre services to outsource customer support, get in touch with us today.